The National Center of Meteorology and the National Institute of Astronomical and Geophysical Research in the Arab Republic of Egypt signed a memorandum of understanding on scientific and research cooperation in the field of Seismology, which is considered one of the requirements for maintaining sustainable development. The agreement will also contribute to the enhancement of technical cooperation and the exchange of experiences between them, leading to the establishment of a joint database and information on seismic activity in their countries and on the Arabian Peninsula, which will benefit the two countries and the Arab region. 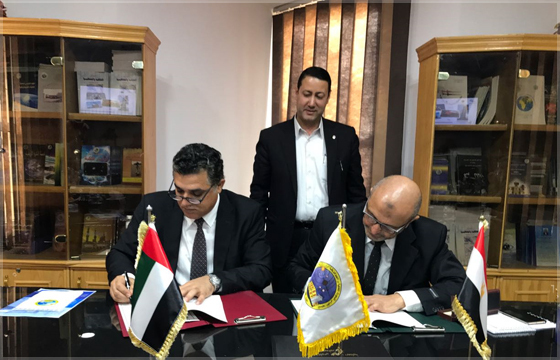 The agreement was signed by Dr. Abdullah Ahmed Al Mandous, Director of the National Center of Meteorology and the National Institute of Geophysics Research, Dr. Hatem Hamdy Odeh, President of the Institute. Dr. Abdullah Al-Mandous and the director of the National Institute of Astronomical and Geophysical Research, visited the scientific sections and specialized laboratories in the fields of earthquakes, geophysics, and astronomy and space research at the Institute. The agreement stipulates the formation of a joint committee to follow up the implementation of the Convention and technical issues and difficulties that may arise and find appropriate solutions to them and make recommendations to make the necessary amendments and submit them to the competent authority of both parties for approval. In this regard, Mandous stressed that cooperation with the Institute comes from the directives of His Highness Sheikh Mansour bin Zayed Al Nahyan, Deputy Prime Minister and Minister of Presidential Affairs, to consolidate relations and promote cooperation with Egypt in the fields of meteorology and Seismology and also within the distinguished relations with the Arab Republic of Egypt. All fields. HE Dr. Hatem Odeh, President of the National Institute of Geophysics Research, said: "Scientific and technical cooperation between Arab countries is important to support reducing the risk of earthquakes and maintain sustainable development. In this context, His Excellency invited Dr. Abdullah Al Mandous, Director of the National Center for Meteorology, to participate in the 6th Arab Conference of Astronomy and Geophysics 2018, which is being held under the auspices of the League of Arab States in Cairo. It is worth mentioning that the National Institute of Astronomical and Geophysical Research, or Helwan Observatory, is an astronomical observatory located in Helwan, south of Cairo, Egypt. It was founded in 1903 and is one of the oldest, largest and most important astronomical observatories in the Arab world. Fixing the dates of the months in the Hijri calendar.